Nicholas Horcher. Courtesy of Raupp Memorial Museum, Buffalo Grove, Illinois. [S11] John J. Weidner, Compiled Birth, Death, 191, 192, 194, 202, 214, 221, 224, 226, 230, 586. [S40] Cook County Herald, 28 Sep 1917, p. 1, col. 3. [S139] Arlington Heights Herald, 11 Apr 1952, p. 8, col. 2. [S742] Arlington Heights Herald, 08 Aug 1963, p. 29, col. 1. [S928] Arlington Heights Herald, 07 Mar 1952, p. 24, col. 3. [S942] Wheeling Herald, 08 Aug 1963, p. 1, cols. 2-3. [S1393] Daily Herald, 04 Apr 2012. [S11] John J. Weidner, Compiled Birth, Death, 224. 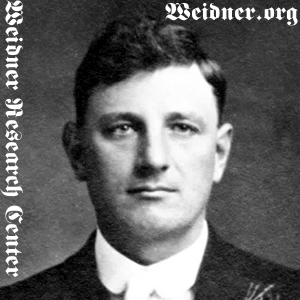 [S11] John J. Weidner, Compiled Birth, Death, 224 date only. [S139] Arlington Heights Herald, 11 Apr 1952, p. 8, col. 2, date and location. [S11] John J. Weidner, Compiled Birth, Death, 214, 224, 586. [S57] Cook County Herald, 21 Nov 1919, p. 8, col. 5. [S742] Arlington Heights Herald, 08 Aug 1963, p. 29, col. 1, Death year only. [S942] Wheeling Herald, 08 Aug 1963, p. 1, cols. 2-3, Death year only. [S11] John J. Weidner, Compiled Birth, Death, 194. [S927] Daily Herald, 27 Jul 2007, sect. 4, p. 4, col. 1. [S1379] Daily Herald, 02 May 2004. [S11] John J. Weidner, Compiled Birth, Death, 230. [S11] John J. Weidner, Compiled Birth, Death, 221. [S11] John J. Weidner, Compiled Birth, Death, 202. [S11] John J. Weidner, Compiled Birth, Death, 227. [S11] John J. Weidner, Compiled Birth, Death, 187.